Shale Gas Debate-UK widget added to my pages. Science Ecosystem 2.0: how will change occur? : "Report: Science Ecosystem 2.0: how will change occur?" saved as draft December 15, 2015. Appologies for my timidity in bringing this to readers attention.. Not the stuff of a true inventor you may think The following nomination of Professor Angela Belcher as a Fellow of the National Academy of Inventors (NAI). is simply an excuse to pay tribute to invention & inventors so much needed in economies of all ages.Perhaps there are ideas to be found in this nomination and the Institution which highlights such achievements. "Election to NAI Fellow status is a high professional distinction accorded to academic inventors who have demonstrated a prolific spirit of innovation in creating or facilitating outstanding inventions that have made a tangible impact on quality of life, economic development, and the welfare of society. The 168 named today bring the total number of NAI Fellows to 582, representing more than 190 prestigious research universities and governmental and non-profit research institutions. The 2015 Fellows account for more than 5,300 issued U.S. patents, bringing the collective patents held by all NAI Fellows to more than 20,000. These academic luminaries have made a significant impact to the economy through innovative discoveries, creating startup companies, and enhancing the culture of academic invention. The NAI Fellows will be inducted on April 15, 2016, as part of the Fifth Annual Conference of the National Academy of Inventors at the United States Patent and Trademark Office (USPTO) in Alexandria, Va. USPTO Commissioner for Patents Andrew Hirshfeld will provide the keynote address for the induction ceremony. Fellows will be presented with a special trophy, medal, and rosette pin in honor of their outstanding accomplishments. The 2015 NAI Fellows Selection Committee included 17 members, comprising NAI Fellows, recipients of U.S. National Medals, National Inventors Hall of Fame inductees, members of the National Academies and senior officials from the USPTO, Association of American Universities, American Association for the Advancement of Science, Association of University Technology Managers, and National Inventors Hall of Fame." "Concorde was grounded 2003.If supersonic flight is ever in to return, the noise it makes must be toned down. 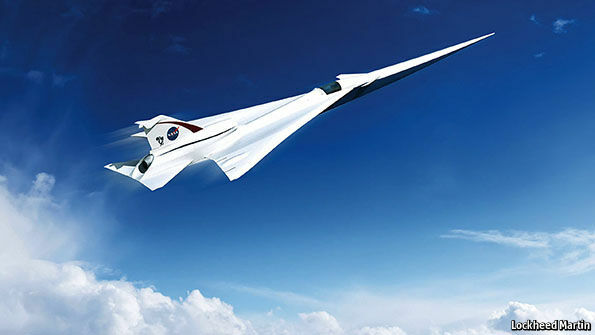 NASA is working on a small single-engined jet, which engineers think will reduce a sonic boom to a soft, faraway thump. Whether such aircraft will be built is a different matter. Technology makes it possible, but the business case is trickier. Small supersonic executive jets might be first into the air,writes the Economist's innovation editor. " 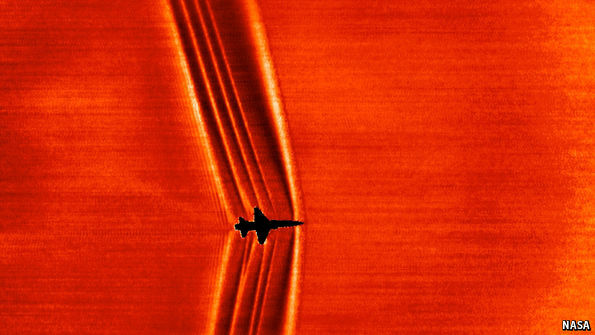 A sonic boom is formed when an aircraft travels faster than the speed of sound, which is around 1,240kph (770mph, or Mach 1) at sea level. Air molecules simply can’t get out of the way fast enough and pile up at certain points on the aircraft. That creates an instantaneous change in pressure, resulting in a wave that contains a huge amount of sound energy. The first wave starts at the nose and others are created along its length. At the rear of the aircraft, a “recompression shock” is formed when the rapid pressure change switches back to normal pressure. As they radiate away, the waves tend to coalesce to form two main shock waves. This is why a supersonic jet passing overhead is often heard as a distinctive double boom. single-engined jet, which engineers believe will be able to reduce a sonic boom to something that resembles a soft thump in the distance. Among the aircraft’s features are a long triangular-shaped nose and an engine inlet blended into the upper wing (pictured). These are designed to smooth out the shock waves. The aircraft will also fly a little slower than Concorde, which cruised at Mach 2. If all goes well, the American aerospace agency hopes to begin trial flights around 2019 to see if the “low boom” this test aircraft is supposed to create is acceptable to the public. If it is, then its noise “signature” might become a certification standard for future supersonic passenger aircraft. Whether such aircraft will be built is a different matter. Modern aerospace technology certainly makes it possible, but the business case is trickier. This is why some think small supersonic executive jets might be first into the air. A number of groups are planning them, including Aerion, a company based in Nevada, which is developing a Mach 1.5 executive jet called the AS2. The plan is to have a prototype ready for test flights in 2019. Supersonic airliners with 100 or more seats would be commercially more risky. But if the suits flying in executive supersonic jets prove there is demand for a journey time of six hours to just about anywhere in the world, then someone might build one. Well in the short term Cop21 web conference will have to do-Not quite the Supersonic Aircraft design, stuff of dreams, as was Concord the most beautiful aircraft ever designed and a true tribute to engineering. Incredible Technological feat from MIT! "Researchers at MIT have now demonstrated the thinnest, lightest solar cells ever produced. Though it may take years to develop into a commercial product, the laboratory proof-of-concept shows a new approach to making solar cells that could help power the next generation of portable electronic devices. In this initial proof-of-concept experiment, the team used a common flexible polymer called parylene as both the substrate and the overcoating, and an organic material called DBP as the primary light-absorbing layer. Parylene is a commercially available plastic coating used widely to protect implanted biomedical devices and printed circuit boards from environmental damage. The entire process takes place in a vacuum chamber at room temperature and without the use of any solvents, unlike conventional solar-cell manufacturing, which requires high temperatures and harsh chemicals. In this case, both the substrate and the solar cell are “grown” using established vapor deposition techniques.""